RSP Nutrition has been on a roll lately, releasing all kinds of new supplements. The newest addition to that new line of products is the IsoPost, a complete post workout recovery Isolate protein formula with an interesting twist. 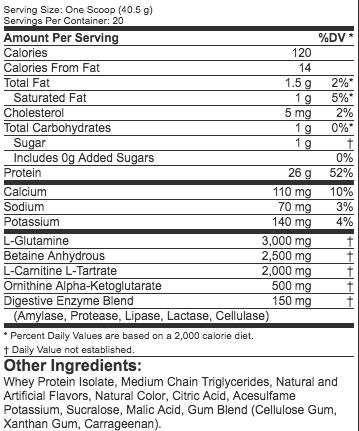 IsoPost gives us an interesting formula: It contains a hefty dose of 26g of protein, all coming from whey isolate, not something you usually see in a post workout. Other than the protein, you get 1g of carbs, 1.5g fat (1g saturated), 1g of sugar and all that totals at 120 calories. For the recovery part of the IsoPost, we have 3g L-Glutamine, an ingredient with benefits of promoting muscle growth and decreasing muscle wasting, improved athletic performance, and recovery from endurance exercise and Improved metabolism and cellular detoxification. Next up we have 2.5g Betaine Anhydrous, usually used in pre-workouts for its strength and endurance enhancing properties, but it is here for its protein synthesis abilities. 2g L-Carnitine L-Tartrate, or LCLT, reduces muscle damage, and overall improves recovery. All of these will be better used and absorbed thanks to the Digestive Enzyme Blend, which is solely here to improve metabolism and absorption. The IsoPost has an interesting ingredient profile. The idea is to optimize your post workout shake and go way beyond traditional protein and replace probably 4 different supplements. It combines ingredients to make not only a recovery formula but a solid protein source as well. Flavors are Lemon Lime Sherbert and Strawberry Kiwi, and and we have to admit that both of them are really good! RSP is thinking post workout shake and well they hit it right. The mixability is also great. The Strawberry Kiwi is a unique combo and RSP nailed it. Effectiveness – Results wise, the IsoPost is awesome as well. First and foremost, you have to deal with way fewer supplements and just focus on ISOPOST. Second, after about a week into it, I can safely say you do feel more recovered! The IsoPost is quite pricey, especially considering the tub is only 20 servings with a price tag of $34.97 for both flavors. With that said, you pretty much get 3 supplements in one, which at the end of the day might actually make a better deal than getting a recovery formula and a protein powder separately. Obviously, you should always compare prices on our price comparison engine and sign up to the Fitness Deal News deal alerts, making sure you always know when the next ISOPOST deal is out there. 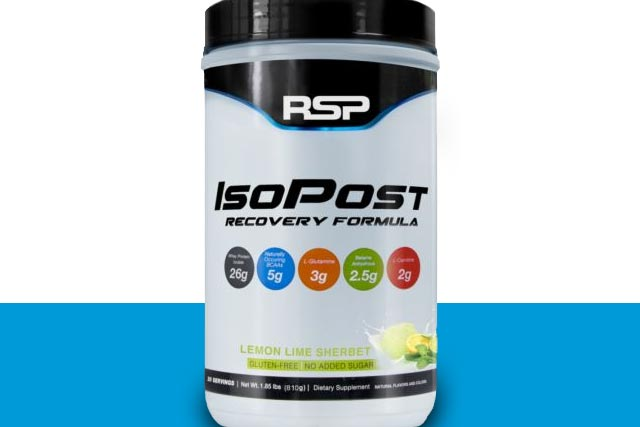 RSP really changed things up and gave us a new kind of recovery formula in the IsoPost. It combined the benefits of a recovery formula as well as the benefits of a protein powder, and all that with a great flavor. We like the idea and the execution.